The 2018 league saw the continuation of Galway’s upward curve as well as perhaps a chink in the Dublin armour as they lost a regular league game for the first time since March 2015. As will be outlined below Galway played the league differently to everyone else and make an interesting hook when reviewing various metrics; they have thus been added to the recent “Big Four” when reviewing how individual teams perform. A few of the metrics were introduced in the Week4 review (here) so this review can be seen as an extension of that piece now that we have more date. In boxing they say that styles make fights. In football team set ups and tactics make games. Dublin v Donegal, at 103 possessions during the game, had 26 (34%) more possessions than Dublin v Galway in the league final. Galway continues to play a different game to everyone else. Of the 36 individual team outings (two each per the 18 TV games) Galway’s volume of possessions only once came close to the average of 45.2 a game when they recorded 44 against Monaghan. Otherwise their remaining four fixtures all ranked in the bottom five in terms of possessions. Only in the aforementioned Monaghan game did they have more possessions than the opposition – in that instance two. In the other four games they lost the possession battle by 3, 6, 7 and 8 respectively. Whilst the spread of possessions at 26 (max = 103, min = 77) would appear to be wide it is actually more condensed than the 2017 Championship when the spread was 34 (113 possessions in the Galway v Mayo game and 79 in the Carlow v Dublin game). Yep that’s the same Galway one competition and about six months removed. I am currently finding it very hard to reconcile the Galway of 2017, which was involved in games with 113 and 110 (QF v Galway) possessions, with that of the 2018 league where the possession count never topped 86! As well team possessions we also have the number of successful passes within each possession. This can be used as a proxy for that dreaded word – transition. Dublin’s method of continually probing whilst stretching teams wide has been readily commented upon and it shows up here. They own six of the 11 sequences where there was a minimum of 20 player touches. Those possessions and their outcomes are listed below. After first producing this table I was asked if it was meaningful that only four of these possessions led to a score. I don’t believe so (a) as the volume is too small to make any concrete statements on and (b) the intention wasn’t always to score – some of these were teams playing keep ball to wind down the clock. Whilst the above table is “interesting” it doesn’t provide any usable insight. That will come. For instance; once enough data is gathered we can see whether moving the ball through multiple players or the quick strike is more productive. Which teams play fast on the counter – and which teams do not. Until then – we’ll have to do with the “interesting” table! – the remainder coming from restarts and shots gone awry (short, blocked and picked up, off the post etc.). Just knowing that alone you can see why kickouts are such a focus. But should they be? Teams shoot as frequently on their turnovers as they do on their own kickouts. Despite, notionally, teams not being as set when they turn over the ball inside the opposition’s 20m line they allow shots less often than on short kickouts. Dropping the ball into the keeper’s hands is not the mortal sin we have been led to believe …. Surprisingly Dublin didn’t excel anywhere and were (relatively) poor on their own kickout. Galway – as is necessary given their low possession game – were above average in all phases. A measure of their efficiency – they won four of the ten restarts and scored 0 – 04; they regained the ball 5 times from shots dropping short, coming off the post etc. – they scored 0 – 05. – Average Conversion Rate at 55.7% is a 3.3% increase on the 53.9% recorded during the 2017 Championship. There are many reasons as to why this might be but it is just worth noting for a rising ship should lift all boats. 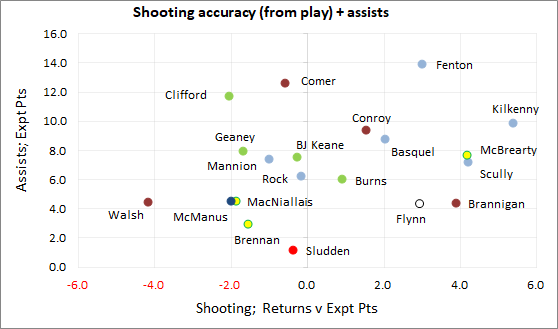 – Dublin did not produce more shots than the opposition (Tyrone actually produced an extra 2.5 shots per game – small sample size alert – whilst only Mayo produced less shots per possession) but were head and shoulders above everyone else when it comes to shooting accuracy. Noteworthy, however, that this was just a continuation of their 2017 form when they recorded a 62.3% Conversion Rate. – Galway have been very accurate but in a different way to Dublin. Dublin were 60% from play whereas Galway were 52%. But Galway had a significantly greater volume of their shots skewed towards the higher percentage deadballs (26% of Galway’s shots were from deadballs as against 18% of Dublin’s). If the frees dry up, or McHugh’s radar is off, can they generate enough shots from play to overcome their low possession and average Conversion Rates? – Mayo struggled offensively throughout the league. Their shots per game and their accuracy were both well below the league average. They will be fervently hoping that come the Championship they will be back up to their 2017 levels when they produced 0.63 shots per possession, with a 54% Conversion Rate, across ten games. Another aspect of attacking play is the frequency that teams go for goal. We all know that goals can inflict monumental damage no matter when they occur (Dublin in the 4th minute against Tyrone in the 2017 semi-final?) but knowing and doing are different things. Do teams go for goal at different rates? Anyone surprised to see Dublin be so far ahead of the opposition on the frequency of their goal attempts? Me neither. Though I am somewhat surprised to see just how bunched the rest of the teams were. That gap, and bunching, was not evident during 2017 (below). The differing quality of opposition – as opposed to the league when everyone’s opponent is of a comparable standard – feed into the higher rates observed in 2017. 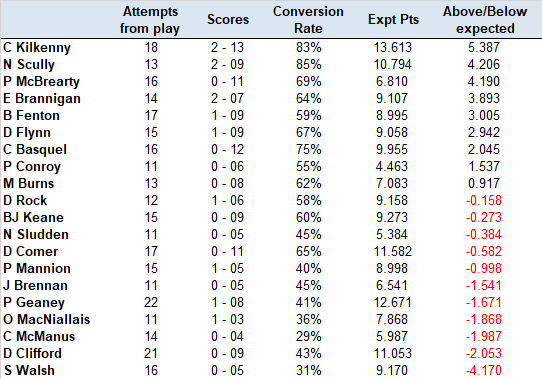 The average Conversion Rate for all attempts from play is 47%. There are reasons why a particular player’s results might vary from this (shooting more against better teams, close in shots versus those from the wings etc.) but it is a very useful yardstick. In that context Dublin’s trio of Kilkenny, Scully and Basquel are off the charts. I don’t care if all shots were taken against beaten dockets (they weren’t) or if there was absolutely no pressure (there was) – that is incredible shooting. Considering he is Donegal’s main man, and has the added responsibility of taking the frees, McBrearty’s numbers are no less stellar. Defenders know he is getting the ball, they know he is shooting off his left (15 of the 16 point attempts were off his left), yet he still produces. Comer’s returns look unusual in that he has a very high Conversion Rate but has below average Expt Pts. The simple explanation for this is his poor returns on goal attempts. He had four shots at goal across the five TV games scoring 0 – 03. This helps his Conversion Rate enormously (75%!) but harms his Expt Pts return as he’d be expected to score 1 – 02 from those four attempts. It is a rare enough deadball table that shows Dean Rock comprehensively outplayed but Barry McHugh did just that during this league campaign. Brennan & Clifford also had better Conversion Rates than Rock but their Expt Pts mark was very similar to his showing that they converted slightly easier frees more often. McHugh’s shooting was not only more accurate (90% Conversion Rate vs 83% for Rock) but also much better in terms of Expt Pts (+2.4 vs +1.1) indicating he converted much harder frees at the same, or a better, rate. Given the aforementioned lack of possessions Galway have a higher need to squeeze as much out of each one as possible. They did this throughout the league in no small part due to McHugh’s proficiency. Mayo’s deadball woes were very evident throughout the whole campaign. As a team they were 69.5% (0 – 32 from 46) on deadballs leaving 0 – 05 behind them when compared to what the average Conversion Rates on those 46 attempts would be. This was very similar to the 2017 returns where they returned 69.4% (0 -50 from 72) and an Expt Pts mark of -5.36. That being said Fenton remains an absolute beast – he is no midfielder. Rather he is a master puppeteer centre half forward laying off ball to the shooters and/or converting at a ridiculous rate himself. Despite the above notes on the volume impact we can see the affect Comer and Clifford had throughout the league. Their shooting was by no means stellar but their involvement in setting up teammates was excellent as measured by the impact of their assists. Comer’s direct running plays a part here – Galway took a shot directly from 11 possessions in which Comer was fouled, the next highest was 5. Granted there is huge discrepancy in the volume of minutes played but that is stark. Dublin allow more shots, on a per game and a per possession basis, than the other big teams which, when you consider their recent dominance and the fact they won the league is a remarkable thing. But even more remarkable is the poor Conversion Rate from Dublin’s opposition. The average is ~56%; Dublin’s opponents are at ~47% whilst no one else dips below 53%. Why would this be? We have never been able to concretely attribute poor offensive numbers to either good defending or poor attacking. To date we have had to assume it is a mixture of both. But there are some obvious things we can look at when one teams’ numbers are so out of step with the norm. Frees; Frees are converted much more readily than attempts from play. If the ratio of frees faced by Dublin is vastly different than that of other teams this would affect the overall Conversion Rate. It is different but not vastly; 22% of the shots faced by Dublin were frees as against 24% for everyone else. That equates to about 0.25 frees per game which isn’t really worth a whole lot in terms of Conversion Rate divergence. Dublin’s opposition converted frees at 73% – the league as a whole was 77%. Small gains but nothing earth shattering. From play; So if it is not frees then it must be from play. The league average conversion rate on point attempts was 49% (the 47% mentioned earlier also includes goal attempts); Dublin only allowed 39%. That old chestnut – excellent Dublin defending or poor attacking? It is not strong Dublin defending per se – I chart the pressure applied to each shot and the Dublin defence applies “strong or severe” pressure to the shooter at a league average rate (44% for the league, 42% for Dublin). There is something in where Dublin’s opposition shoot from however; against Dublin 47% of the point attempts come from the wings between the 20m & 45m lines – the league average is 38% and if we remove Dublin that drops to 36% for the other six teams. So in a sense it is Dublin defending. We have seen that they allow more shots per game but they “let” you shoot from more disadvantageous regions – this would also feed into why their pressure % is not as high as expected. Playing Dublin; But then again we have another overriding theme – the pressure of playing Dublin. When we restrict the pressure index to central shots only Dublin are relatively poor – only 31% of opponent’s shots centrally were taken under strong or severe pressure as against the league average of 44%. Low volumes but still! The kicker is that 53% of these central shots against Dublin were converted as against 63% for the rest of the league. We cannot place this performance on Dublin defending – indeed the opposite is true. The Dublin pressure is less intense. Teams missed the simplest of shots (centrally and under no pressure) at a higher clip. Enough of Dublin! The conversion rate of Tyrone’s opponents is almost comically high. I double checked just to be sure. In Tyrone’s three games Dublin hit 68% of their shots, Monaghan 63% and Kildare 62%. It is only three games, and the comparable 2017 return was a combined 48% (five games) so I’m sure Mickey Harte and the backroom team are not overly concerned. On the whole all teams are winning a lower percentage of their own kickouts when compared to the 2017 Championship campaign (73% won in 2017, 66% won in 2018) with none of the highlighted Division1 teams bucking this trend. Part of the reason for this is that the volume of short kickouts has dropped (a consequence of the new rule – either directly or indirectly as teams kicked longer in anticipation of the press that will surely come during the Summer) from 47% in the 2017 Championship to 40% in the 2018 League. Teams win their own short kickouts at a 94% clip so if there are significantly less of them the overall win rate will suffer. There was also a drop in the percentage of kickouts past the 45m line won by the kickout team – from 56.9% to 54.5%. Small enough but when you combine the two – a greater volume of longer kickouts with these longer ones won less frequently – we get a decent drop in the win rate. Outside of the win rates it is interesting to see who is the most productive. Dublin are generally considered Kings of the kickout but in terms of net effectiveness they were only above average in this league campaign whilst Tyrone actually outperformed them in 2017. Mayo were very good on their own kickout during the league – they will be hoping that their overall Conversion Rate picks up so that they can build on this strong platform. As is becoming a theme Galway was the outlier. Their net returns on kickouts are very low when compared to the other big guns – with one of the main reasons being that they continue to shun the short kickout. In their five TV games they went short on 27%. 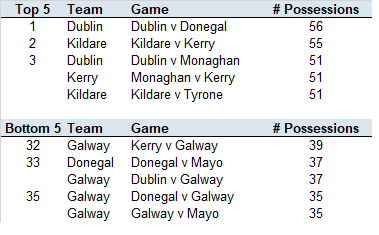 Mayo were 55%, Dublin were at 47% with Kerry and Tyrone at 41% apiece. Volumes become low when we begin to segment like this so the percentages become less reliable however given that they are going short at a lower rate this allows the opposition to “tee off” on their longer ones. When they went past the 45m line Galway won 50% of their kickouts; the comparable figure was 65% for Dublin and 57% apiece for Kerry and Mayo. This entry was posted on April 27, 2018 at 13:26 and is filed under 2018, League, Overview, Review. You can follow any responses to this entry through the RSS 2.0 feed. You can leave a response, or trackback from your own site.